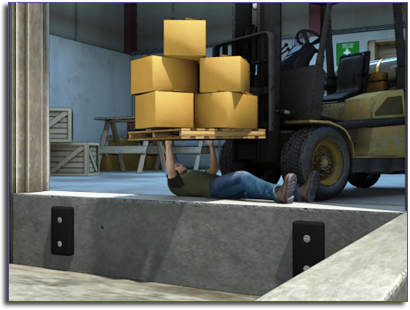 This training module is based on best practices for proper forklift operation and safety. In order to successfully pass this course and receive credit, you must score an 85% or better on this quiz. GOOD LUCK! Back axle, and the other two sides are made up by drawing a line from each back tire to the middle of the back axle, where the main load support is located. Front axle, and the other two sides are made up by drawing a line from each front tire to the middle of the back axle, where the main load support is located. Top of the load, and the other two sides are made up by drawing a line from each back tire to the middle of the back axle, where the main load support is located. Bottom of the load, and the other two sides are made up by drawing a line from each front tire to the middle of the back axle, where the main load support is located. 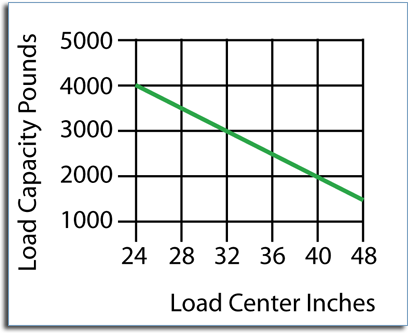 There is a person underneath a raised load. The person under the load is wearing goggles, which might obscure his vision. The forklift is positioned near a dock edge unnecessarily. The load appears loose and unsecured. The forks are tilted back too far. The load is raised even though the operator is outside the cab.